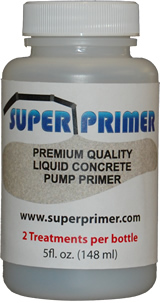 Refer to your concrete pump manual for any specific pump priming requirements. One half bottle (2.5 oz) when mixed lubricates up to 150 feet of 5” line. A sponge or ball pushed ahead of the primer will aid in lubricating the entire circumference of the system. Fill pail/pails with 5-15 gallons of water. Shake bottle for one minute. Pour ½ a bottle of Super Primer into the pail/pails. Let stand for 2 minutes or until thick. Pour Super Primer mixture into priming port or hopper and begin priming. Fill hopper with 5-15 gallons of water. Pour ½ a bottle of Super Primer into hopper. Cycle pump in reverse until mixed.